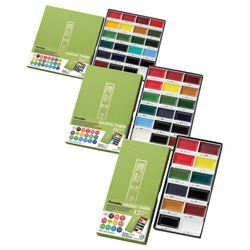 These traditional Japanese solid watercolor sets are great for both professional artists and crafters. Each set features a collection of watercolor pans that are ideal for Etegami, sketches, illustrations, Sumi-e and more. The 12-Color Set includes white, black, scarlet red, red, wine red, lemon yellow, light brown, brown, mid green, green, blue and deep blue. The 18-Color Set includes white, black, scarlet red, red, wine red, lemon yellow, light brown, brown, mid green, green, blue, deep blue, dark pink, purple, may green, ocean green, cornflower blue and cobalt blue. The 24-Color Set includes white, black, scarlet red, red, wine red, lemon yellow, light brown, brown, mid green, green, blue, deep blue, dark pink, purple, may green, ocean green, cornflower blue, cobalt blue, mid yellow, dark brown, pale aqua, olive green, turquoise green and evergreen.